Nairobi is mainly a staging post on the way to see Kenya’s wildlife in the Maasai Mara, or to flying on to the Serengeti and Ngorongoro in Tanzania. But, for those who don’t want to stay in the city, there’s an opportunity 45 minutes from the airport to stay in a lodge and spot wildlife. A black rhino, armour plated, weighing a couple of tonnes, walks purposefully across the green grass that has sprung up with Kenya’s March rains, at the beginning of its winter. What is remarkable is the backdrop. For there, right behind the rhino, are the tall towers of Nairobi’s central business district. Nairobi National Park is literally on the capital’s doorstep. Rashid Hassan and Jeremiah Kasaine, guides for Emakoko, an exclusive lodge just outside the national park, picked me up at the international airport at 3pm and an hour later, here I am watching rhino. I have already seen Maasai giraffe, a pair of huge ostrich, many types of antelope, from mountain reedbuck to Coke’s hartebeest and, of course, the ubiquitous impala — the McDonald’s of the bush, complete with an M on their backsides. I’ll see a crown lapwing, giraffe drinking spread-legged, and three lions. Tonight I will hear a leopard, and more lions growling, growling, growling through the night, in the dark. Nairobi National Park was the country’s first, set up in 1946 just 7km south of that CBD and covering 117 sqkm of the Athi plains, where Maasai people lived and herded their cattle among the wildlife. As the city grew, the area was first set aside as a game reserve, where European settlers rode their horses among zebras, impala and gazelles. Now, in a landscape still mainly open grass plain scattered with acacia bushes, the Kenya Wildlife Service polices against poaching. Telling me the difference between black and white rhino, Rashid adds: “In three years, there have been no cases of poaching.” There are about 60 rhino in the park. The name “white” is thought to have originated from the word “wide”. It has a wide mouth for grazing, and is social, tending to live in groups. The black eats more twigs and branches and tends to be solitary. And then we come to a fence. It stretches from horizon to horizon. Some locals have nicknamed it, rather bitterly, “the great wall of China”. “The Chinese doing what they do best,” one murmurs, as we pass it again the next day. Construction of the Standard Gauge Railway by China Road and Bridge Corporation started early in March, despite earlier court orders halting it. As a compromise, following fierce opposition, the railway will be elevated on 114 concrete pillars and won’t touch the ground. The lowest will be 7m tall, the highest 40m. Kenya Wildlife Service believes that animals will still be able to move free throughout the park. But two parallel fences have been put up, with the construction work going on between, despite assurances that wildlife would be disrupted as little as possible during the 14 months of railway construction. Rashid and Jeremiah certainly understand wildlife. Rashid is an experienced guide for Emakoko, and Jeremiah previously spent three years guiding in the Maasai Mara. He says: “It is a good way to be an ambassador for your country. You can share the flora and fauna and culture. This is how you become connected. I tell him when people struggle with my surname, I just tell them to call me Soccerfield. Certainly we all feel that connection, as we watch the world’s biggest flying bird, a kori bustard, fluffed up in a splendid territorial display. Male kori bustards show off to females by strutting around a site with their crest erect and tail feathers standing upright and fanned out. Just like this one. The neck can inflate up to four times its usual size, and it raises its head and opens its beak. For all this huge show of might, blackbird lapwings come flustering in, dipping at the bustard. I say they’re buzzing him. 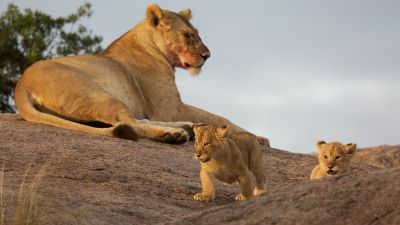 And we drive on in the safari vehicle to watch zebra drink, spread-legged, and three lions, lazy in the evening grass. WHERE: Nairobi is mainly a transit point but there is the chance to spot wildlife not far from the capital. WHEN: Nairobi never gets the blistering heat of other parts of Africa. Summer months in Nairobi are December to March, with temperatures peaking in the mid 20s. The winter months of June to September are cooler. WHO: Anyone chasing African wildlife. Kenya’s Maasai Mara has lots of wildlife on big plains and good safari camps. Most people will only spend a night in Nairobi, and then move on to safari. But get a taste of safari first at Emakoko. WHAT: You are best off with a touring company or guide with local knowledge. There are craft and culture stores, environment experiences at Karura Forest and Giraffe Centre and a chance to visit the home of Karen Blixen, the author of Out of Africa, which is now a museum. HOW: Fly to Nairobi via Johannesburg with South African Airways and easy connections. flysaa.com. Stephen Scourfield was a guest of Abercrombie and Kent. They did not review or approve this story. They call them the 'king of the jungle' but the lions of the Serengeti are more like pussycats and love nothing better than a catnap after a big feed. 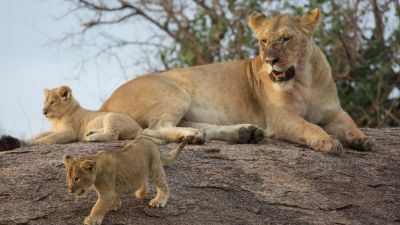 Travel Editor Stephen Scourfield visits Serengeti National Park in Tanzania and finds it teeming with lions and their cubs.